Glucagon-like peptide-1 (GLP-1), an important mediator of postprandial glycaemia, could potentially be stimulated by delivering small quantities of nutrient to a long length of distal gut. We aimed to determine whether enteric-coated pellets, releasing small amounts of lauric acid throughout the ileum and colon, could reduce glycaemic responses to meals in type 2 diabetes, associated with stimulation of GLP-1. Eligible patients, who had type 2 diabetes controlled by diet or metformin, were each studied on two occasions in a hospital setting. After an overnight fast, patients consumed 5 g active pellets (47% lauric acid by weight) or placebo with breakfast (T = 0 min) and lunch (T = 240 min), in a crossover design with order randomised by the hospital pharmacy and allocation concealed by numbered containers. Patients and investigators making measurements were blinded to the intervention. Blood was sampled frequently for blood glucose (the primary outcome) and hormone assays. Eight patients were randomised (four to receive either intervention first), and all completed the study without adverse effects. Blood glucose was lower after breakfast (T = 0–240 min, area under the curve (AUC) 2,075 ± 368 vs 2,216 ± 163 mmol/l × min) and lunch (T = 240–480 min, AUC 1,916 ± 115 vs 2,088 ± 151 mmol/l × min) (p = 0.02 for each) after active pellets than after placebo. Plasma GLP-1 concentrations were higher after breakfast (p = 0.08) and lunch (p = 0.04) for active pellets. While there were no differences in insulin or glucose-dependent insulinotropic polypeptide concentrations, glucagon concentrations were higher after breakfast and lunch (p = 0.002 for each) for active pellets. Delivering small amounts of nutrient to the ileum and colon can stimulate substantial endogenous GLP-1 release and attenuate postprandial glycaemia. This novel approach has therapeutic potential in type 2 diabetes. Australian New Zealand Clinical Trials Registry ACTRN12612000600842. The study was funded by Meyer Nutriceuticals. The online version of this article (doi: 10.1007/s00125-013-2876-2) contains peer-reviewed but unedited supplementary material, which is available to authorised users. Achieving good glycaemic control is fundamental to the prevention of the microvascular , and probably macrovascular [2, 3], complications of diabetes. The relative contribution of postprandial blood glucose excursions, as opposed to fasting blood glucose, to overall glycaemic control increases as the glycated haemoglobin (HbA1c) improves [4, 5]. The determinants of postprandial glycaemia include the rate of gastric emptying and small intestinal absorption of carbohydrate, hepatic glucose metabolism and insulin secretion . The ‘incretin’ hormones, released from the gut in response to nutrient exposure, are particularly important in modulating postprandial blood glucose, and account for up to 70% of postprandial insulin secretion in healthy humans [7, 8]. Secretion of the two known incretins, glucose-dependent insulinotropic polypeptide (GIP) and glucagon-like peptide-1 (GLP-1), is largely intact in type 2 diabetes . However, the insulinotropic actions of GIP are diminished, while those of GLP-1 are relatively preserved ; therefore the focus of therapy for type 2 diabetes has hitherto been on GLP-1. In addition to glucose-dependent stimulation of insulin, GLP-1 suppresses glucagon secretion  and has the capacity to slow gastric emptying . GLP-1 agonists, such as exenatide and liraglutide, have now entered mainstream therapy for type 2 diabetes, but are relatively expensive, require subcutaneous injection and are associated with gastrointestinal adverse effects such as nausea . Dietary therapies that stimulate endogenous GLP-1, such as the use of protein or fat ‘preloads’ [14, 15], are therefore attractive, but come at the cost of additional energy intake in individuals who are usually already overweight or obese. The release of hormones and inhibition of gastric emptying in response to nutrients is dependent on the length of gut exposed as well as the region [16, 17, 18]; for example, the density of L cells that release GLP-1 and peptide YY is greatest in the ileum and colon , and ileal infusion of lipid is known to exert a strong inhibitory effect on motor activity of the proximal gut, called the ‘ileal brake’ . Feedback induced by fatty acids is also dependent on chain length; a C12 fatty acid (lauric acid) stimulates greater secretion of GLP-1, peptide YY and cholecystokinin (CCK) than decanoic acid (C10) [21, 22]. GLP-1 and CCK secretion in response to lauric acid infused intraduodenally is dose-dependent . In contrast with CCK, which is released from the proximal small intestine, the GLP-1 response is delayed, suggesting that increasing loads allow progressively more unabsorbed lauric acid to reach the distal small intestine. The physiological principles outlined above suggest that substantial release of GLP-1 could be induced if a small amount of nutrient could be targeted to a long length of distal gut. Meyer Nutriceuticals (Santa Monica, California, USA) has developed a formulation of lauric acid (47% by weight) in enteric-coated pellets, 0.5–1.7 mm in diameter. The enteric coating (Eudragit L100; Evonik Industries AG, Darmstadt, Germany) dissolves at pH >6.0, which is observed in the lumen of the distal jejunum, ileum and colon, and is independent of the colonic flora; similar enteric coating technology is well established for delivering drugs to the ileum and colon . Pilot studies (J.H. Meyer, unpublished data; Fig. 1) have been carried out in healthy volunteers with this formulation, incorporating (1) a 99mTc-polymethylmethacrylate label on the surface of the pellets, enabling their distribution in ‘regions of interest’ to be evaluated using a gamma camera , and (2) 4.7% paracetamol within the pellet, enabling the timing of release of pellet contents to be inferred from changes in serum paracetamol concentrations. When consumed with a standardised pancake meal, to induce a postprandial pattern of gastrointestinal motility, these pellets empty at an approximately linear rate from the stomach, reach the ileum within 1 h, and are located predominantly in the colon after 3 h. Concurrent serum paracetamol concentrations indicate that the pellets release their contents progressively from about 60 min, when the pellets are mainly present in the ileum and colon. The aim of this study was to determine the effects of a small dose of these pellets, consumed with both breakfast and lunch, on the release of GLP-1 and postprandial blood glucose excursions in type 2 diabetes. Eight patients with type 2 diabetes, diagnosed by WHO criteria, were recruited by newspaper advertisement (Table 1; electronic supplementary material [ESM] Fig. 1). None had a history of gastrointestinal symptoms or significant comorbidities, smoked or was taking medication known to influence gastrointestinal function. Two patients were being treated with metformin, which was withheld for 2 days before the start of the study; the rest were managed by diet alone. All patients were evaluated for the presence of autonomic neuropathy by standardised cardiovascular tests (variation in heart rate in response to deep breathing and standing, and fall in systolic blood pressure in response to standing). Each test was scored as 0 (normal), 1 (borderline) or 2 (abnormal), for a total maximum score of 6. A total score of 3 or more was taken as evidence of autonomic dysfunction . The study protocol was approved by the Human Research Ethics Committee of the Royal Adelaide Hospital, and each patient provided written informed consent. All studies were carried out in accordance with the Declaration of Helsinki. The trial was registered with the Australian New Zealand Clinical Trials Registry (www.anzctr.org.au) (registration no. ACTRN12612000600842). The studies took place between July and September 2009. Each patient was studied on two occasions, separated by at least 5 days, in a randomised double-blind crossover design. The randomisation sequence was determined by the Royal Adelaide Hospital Pharmacy using an online random number generator. On the evening before each study (∼19:00 hours), patients consumed a standardised meal (beef lasagne, bread, a non-alcoholic beverage and one piece of fruit). After the meal, patients fasted from solids and liquids (other than water) until the following morning. On each study day, patients attended the laboratory at ∼08:30 hours, and an intravenous catheter was inserted for blood sampling. Patients ingested either 5 g active pellets (2.35 g lauric acid or ∼83 kJ [20 kcal]) or matching placebo pellets at T = 0 min with a breakfast consisting of pancakes, butter, golden syrup and apple puree (71 g carbohydrate, 4.3 g protein, 12 g fat, 1,736 kJ [415 kcal]), and 100 ml water. Blood was sampled at frequent intervals until T = 240 min, when the patients ingested a second dose of 5 g active or placebo pellets with a lunch that was identical with the breakfast. Blood sampling continued until T = 480 min. Patients were seated comfortably in a chair for the duration of the study. Blood glucose concentrations were measured immediately using a glucometer (Medisense Precision QID; Abbott Laboratories, Bedford, MA, USA). The accuracy of the method has been validated against the hexokinase technique . Blood samples were collected on ice and centrifuged at 1,488 g for 15 min. Plasma and serum were separated and stored at −70°C for subsequent analysis. Serum insulin was measured by ELISA (Mercodia, Uppsala, Sweden). The sensitivity was 7 pmol/l, and the intra- and inter-assay CVs were 2.1% and 6.6%, respectively. Plasma total GLP-1 was measured by RIA (Millipore, Billerica, MA, USA). The sensitivity was 3 pmol/l, and the intra- and inter-assay CVs were 6.0% and 7.6%, respectively. Plasma GIP was measured by RIA , with a sensitivity of 2 pmol/l, and intra- and inter-assay CVs of 10.2% and 11.2%, respectively. Plasma glucagon was measured by RIA (Millipore). The sensitivity was 20 ng/l, and intra- and inter-assay CVs were 10.4% and 5.5%, respectively. Blood glucose, serum insulin and plasma hormone concentrations were analysed over post-breakfast (T = 0–240 min) and post-lunch (T = 240–480 min) periods. The data approximated a normal distribution, and are reported as mean ± SEM, other than for autonomic function scores, where a median and range are given. Area under the curve (AUC), calculated using the trapezoidal rule, is also reported for blood glucose concentrations. Statistical comparisons were made using paired t tests for baseline and peak values and repeated-measures ANOVA for the post-breakfast and post-lunch periods (Prism 6.0b; GraphPad Software, La Jolla, CA, USA), and p values <0.05 were considered significant. The primary outcome was a reduction in blood glucose concentration after breakfast and lunch. Secondary outcomes were increases in serum insulin and plasma GLP-1 concentrations. All patients completed the study, and there were no adverse effects. Blood glucose concentrations before breakfast (T = 0 min) and lunch (T = 240 min) did not differ between active pellet and placebo studies, but were lower before lunch than before breakfast (p = 0.06 for active pellets, p = 0.04 for placebo). On each day, the blood glucose increased to a peak 1–2 h after each meal before subsiding. Blood glucose concentrations after breakfast (T = 0–240 min) were lower for active pellets than placebo (AUC 2,075 ± 368 vs 2,216 ± 163 mmol/l × min; treatment effect, p = 0.02), as was the peak blood glucose after breakfast (10.6 ± 0.7 vs 11.4 ± 0.6 mmol/l, p = 0.03). Both the blood glucose concentrations after lunch (AUC 1,916 ± 115 vs 2,088 ± 151 mmol/l × min; treatment effect, p = 0.02) and the peak blood glucose after lunch (9.7 ± 0.7 vs 10.5 ± 0.7 mmol/l, p = 0.03) were lower after active pellets than after placebo. On the active pellet day, both the overall blood glucose concentrations (treatment effect, p = 0.002) and the peak blood glucose (p = 0.04) were lower after lunch than after breakfast, whereas neither differed significantly on the placebo day. Serum insulin concentrations did not differ between study days before either breakfast or lunch, but were higher before lunch than before breakfast for active pellets (p = 0.003), although not for placebo. Insulin concentrations after breakfast (T = 0–240 min) and lunch (T = 240–480 min) did not differ between active pellets and placebo, nor were there any differences in the insulin/glucose ratio between active pellets and placebo after breakfast or lunch (data not shown). Plasma GLP-1 concentrations before breakfast did not differ between study days, but there was a trend for higher GLP-1 concentrations before lunch on the active pellet than the placebo day (24.5 ± 3.9 vs 16.4 ± 1.7 pmol/l, p = 0.07). On each day, GLP-1 increased to a peak about 30 min after each meal before subsiding, and GLP-1 concentrations tended to be higher after breakfast for active pellets than for placebo (treatment effect, p = 0.08), and were significantly higher for active pellets after lunch (treatment effect, p = 0.04). GLP-1 concentrations were also higher after lunch than after breakfast when active pellets were given (treatment effect, p = 0.05), but did not differ with placebo. Plasma GIP concentrations did not differ between study days before either breakfast or lunch, although on both active pellet and placebo days, GIP concentrations before lunch were higher than those before breakfast (p = 0.005 and p = 0.003, respectively). GIP increased to a peak about 30–60 min after each meal before subsiding, and GIP concentrations after breakfast (T = 0–240 min) and lunch (T = 240–480 min) did not differ between active pellets and placebo. Plasma glucagon concentrations before breakfast did not differ between study days, but were higher before lunch on the active pellet than the placebo day (76.5 ± 5.9 vs 62.7 ± 4.7 ng/l, p = 0.01). Glucagon concentrations increased to a peak about 30 min after each meal before subsiding, and were higher after breakfast for active pellets than for placebo (treatment effect, p = 0.002), and also higher for active pellets after lunch (treatment effect, p = 0.002). We have shown that a very small load of lauric acid (∼80 kJ), when given to patients with type 2 diabetes in a formulation designed to release nutrient over several hours throughout the ileum and colon, lowered blood glucose after both breakfast and lunch compared with placebo, which was associated with the stimulation of GLP-1, particularly after lunch. We also observed that blood glucose concentrations were lower after lunch than after breakfast when active pellets were given, consistent with the concept that the breakfast dose of pellets, by continuing to release lauric acid in the colon after lunch, added to the effect of the lunchtime dose, which released additional lauric acid into the ileum. The pellet formulation was not associated with stimulation of GIP, a hormone released from K cells in the proximal gut, as would be expected with targeted delivery of fatty acid to the distal gut. The degree of glucose lowering observed with 5 g pellets in this study was of sufficient magnitude to be clinically significant, providing a reduction in peak blood glucose after breakfast and lunch of almost 1 mmol/l. 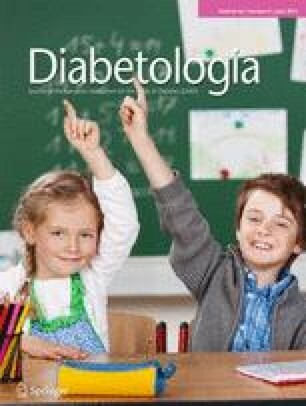 The lowering of blood glucose did not appear to be related to stimulation of insulin by GLP-1, since there was no significant increase in insulin concentrations after breakfast or lunch over placebo, even when taking into account the lower blood glucose concentrations with the former (i.e. the insulin/glucose ratio). After breakfast, this might reflect the relatively late divergence of the GLP-1 curves, when the blood glucose concentration was already falling; i.e. as the insulinotropic property of GLP-1 is glucose-dependent, further stimulation of insulin secretion by GLP-1 was limited. After lunch, it is possible that the additional GLP-1 stimulated by the pellets slowed gastric emptying of the pancake meal, which would tend to offset any stimulation of insulin by GLP-1 [29, 30]. We did not measure gastric emptying, although previous data from healthy individuals indicated that pellets containing lauric acid did not slow gastric emptying or small intestinal transit, compared with placebo pellets (J.H. Meyer, unpublished data). However, this does not exclude the possibility that the emptying of a subsequent meal is slowed. We also recognise that measurement of C-peptide might have provided greater sensitivity to determine whether the active pellets were associated with any augmentation of insulin release, although insufficient plasma was available for these assays. The glucose-lowering effect of the pellets cannot be ascribed to suppression of glucagon. In fact, the lauric acid pellets stimulated glucagon secretion compared with placebo, without which an even greater reduction in glycaemia might have been observed. It can be assumed that lauric acid also stimulated the secretion of glucagon-like peptide-2 (GLP-2), which may account for the rise in glucagon secretion , although we did not measure plasma concentrations of GLP-2. It is also possible that the small intestine could itself have been a source of glucagon secretion, given a recent report that patients with type 2 diabetes have increased numbers of cells positive for prohormone convertase 2 in jejunal biopsy samples, compared with healthy controls (F.K. Knop, unpublished data). Effects of GLP-1 in the portal circulation might well account for much of the favourable effect of the pellets on blood glucose. Vagal afferents with nerve endings bearing receptors for GLP-1 are present in the portal venous system , and activation of these results in glucose lowering through enhanced hepatic and peripheral glucose uptake , in the absence of any stimulation of insulin secretion [34, 35]. Furthermore, stimulation of vagal afferents in the intestinal villi via a paracrine action of GLP-1 represents another important mode of action of this hormone, with the potential to influence blood glucose by feedback to the hypothalamus and medulla . This local effect of GLP-1 is likely to have a prominent physiological role, given the very short half-life of endogenous active GLP-1 in the circulation  and the recent observation in mice that the glucose-lowering effects of endogenous GLP-1 are enhanced by the dipeptidyl peptidase IV inhibitor, sitagliptin, when the latter is given orally in very low doses that selectively inhibit intestinal dipeptidyl peptidase IV, without affecting intraportal concentrations of active GLP-1 . Although receptors to GLP-1 have hitherto not been demonstrated on nerves in the intestinal villus or in ileal submucosal and myenteric plexi, the presence of receptors for the closely related peptide, GLP-2, has been reported in myenteric ganglia . Our study, which should be regarded as ‘proof-of-principle’, has some limitations. The number of patients was small; however, the effects observed were relatively consistent. We evaluated acute effects of two doses of pellets only, and further studies would be needed to determine whether these effects are sustained with prolonged use, and also whether they can be generalised to patients with less well controlled diabetes. We examined only one dose of pellets in this study. Studies in healthy volunteers had indicated that a higher dose of pellets (10 g) appeared to pass through the terminal ileum more rapidly, and therefore a dose of 5 g was thought optimal for sustained ileal exposure to lauric acid (J.H. Meyer, unpublished data). We did not evaluate the capacity of the pellets to release GLP-1 in the absence of a meal, because it was important to administer the formulation with food to regulate its transit through the stomach and small intestine; however, the difference in GLP-1 concentrations between active and placebo days, particularly after lunch, was marked, and the timing of the divergence of the curves is in keeping with prior studies supporting delayed release of pellet contents in the ileum and colon. We believe that metformin, which may stimulate GLP-1 release , was unlikely to affect the outcome, since only two participants used this drug, and it was withheld for 2 days in these patients, which equates to several half-lives. The carbohydrate load at breakfast and lunch was relatively high and it would be important to determine the effects on glucose lowering after lower carbohydrate meals. In summary, our observations support the concept that a very small nutrient load, if exposed to a long length of the distal gut, can induce substantial GLP-1 stimulation, with a concomitant reduction in postprandial glycaemia. It would be appropriate to develop this approach further, for example to mimic the beneficial effects of obesity surgery or GLP-1 agonists, with less expense and fewer adverse effects, in patients with type 2 diabetes. This study was funded by Meyer Nutriceuticals, Santa Monica, CA, USA. In addition, the authors received research funding from the National Health and Medical Research Council of Australia (NHMRC). K.L. Jones’ salary is derived from a Senior Career Development Award provided by the NHMRC. J.H. Meyer has a 75% interest in Meyer Nutriceuticals. However, the manuscript was written primarily by the other authors, who performed the studies and collated and analysed the data. The conclusions stated are those of the other authors, although J.H. Meyer contributed to the Discussion. The other authors declare that there is no duality of interest in connection with their involvement in this study. JM contributed to the study design, acquisition, analysis and interpretation of data, drafted the article, and approved the final version. HLC contributed to acquisition of data and critical review of the article, and approved the final version. JMW contributed to analysis of data and critical review of the article, and approved the final version. JES contributed to study design, acquisition of data, and critical review of the article, and approved the final version. KLJ contributed to study design and critical review of the article, and approved the final version. MH contributed to study design and conception, and critical review of the article, and approved the final version. JHM contributed to study design and conception, interpretation of data, and critical review of the article, and approved the final version. CKR contributed to study design, analysis and interpretation of data, and drafting of the article, and approved the final version.